In light of the big holiday weekend I thought I would surprise you with a bonus shot recipe, and this one is easy to make, and big on style points. 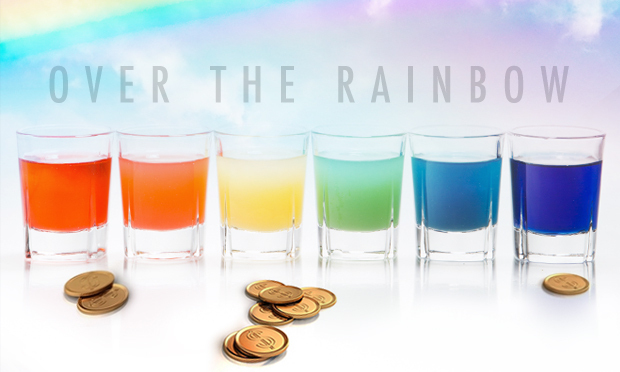 Great for kicking off St. Patrick’s Day, OR heading out to see the Wizard of Oz prequel, these Over The Rainbow shooters are an absolute must for this weekend. Add 1 oz of Clique Vodka, and 1/2 oz of pomegranate liqueur to an empty pint glass, then fill with ice. Add 2 oz of pineapple juice slowly so that it roughly layers on top of the pomegranate. Dribble another 1 oz of Clique Vodka over the ice and put a hawthorn strainer on top. Add 1 oz of blue curacao over the top over the strainer and immediately pour the contents into 6 shooter glasses, one at a time. 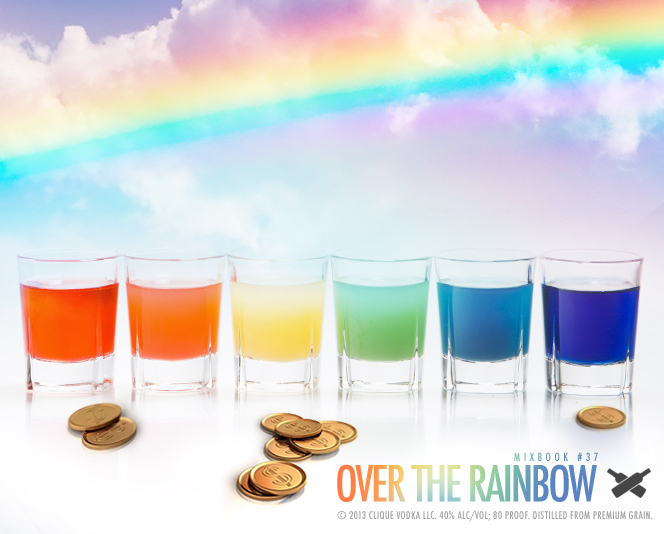 If you time it right you will end up with 6 different color shots making a perfect alcoholic rainbow with each shot tasting different. Taste test them all with friends, or each take one, either way they are sure to be magically delicious this weekend, just make sure you have you Drinkypal app downloaded before you start going shot crazy!